The Élysée Palace was distraught this week as GQ declared Nicolas Sarkozy to be the third worst-dressed human man of 2009. Clearly incorrect. 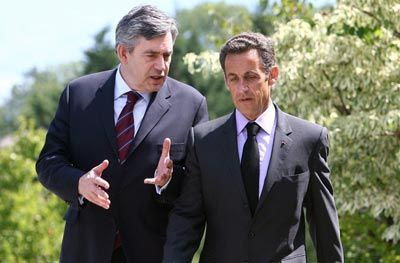 Ever since his election, I've been struck Sarkozy's consistent elegance: impeccably turned out in dark Dior suits, crisp neutral shirts and sharp understated ties. There may not be too much variation, but anyone with a uniform of dark Gallic style is fine by Mr Christopher. 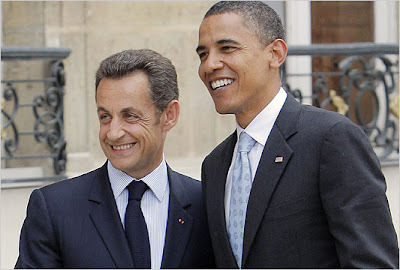 Who looks better: Obama or Sarkozy? He may not be quite so slim as he would like but when it comes to couture, Sarko is smooth as a button and sharp as a stick. He's certainly not BAD. David Cameron as best dressed #8? Nothing wrong with him, but he's guilty of the odd pink shirt, crap tie and podgy waistband. The guy is one step away from brown shoes with a grey suit. Even though it's a horrible 'power photo', imagine how thrilled we would be if Dave, Gordy or anyone else in British politics stepped off a plane looking like this (left). I'd like it anyway. So hush your mouth GQ. And please don't put your own editors in the top ten. It looks a little biased. Sarah Palin's favourite founding father? Snow joke to be cut adrift!